On a recent trip to Vancouver, BC I picked up several planes which included the Veritas Skewed Edge Trimming Plane. There is a right and left hand version but if the boards two sides are decently flat you can just change the side the fence goes on so you can plane with the grain. Let me get to the bad first. The fence on the plane was not exactly 90 degrees but closer to about 91.5. When I planed two boards and matched them there was a crack of about 3 degrees. I could change the angle slightly by making lateral adjustments to the blade as this causes the corers of the edge to raise or lower. But it affects the cutting quality of the blade as the lowered edge makes a deeper cut. Using Porter Cable sticky backed sandpaper on my cast iron table saw I worked on the fence until I could get it to 90 degrees. It was difficult because it was the inside corner that needed to be worked on but starting with 80 grit and going to 120 then 180 did the trick. Spent about an hour working slowly, including flattening the sole (side with the blade) and I didn’t want to over shoot the 90 degrees. After planing you can see the mismatch. Tried different adjustments to no avail. Finally sanded the error so it was 90 degrees. The plane has the usual depth screw adjuster which worked well. Lateral adjustments are done manually by loosening the hold down plate and manually pushing the back of the blade side to side which is a bit crude but works. I wish it was easier to make fine adjustment as this affects the 90 degree angle as well as the shavings. There are also two screws that adjusts the front of blade laterally. It pinches the blade laterally and together with the back lateral adjuster gives you an even shaving and can effect the 90 degree angle of the cut but with undesirable effects on the shavings. 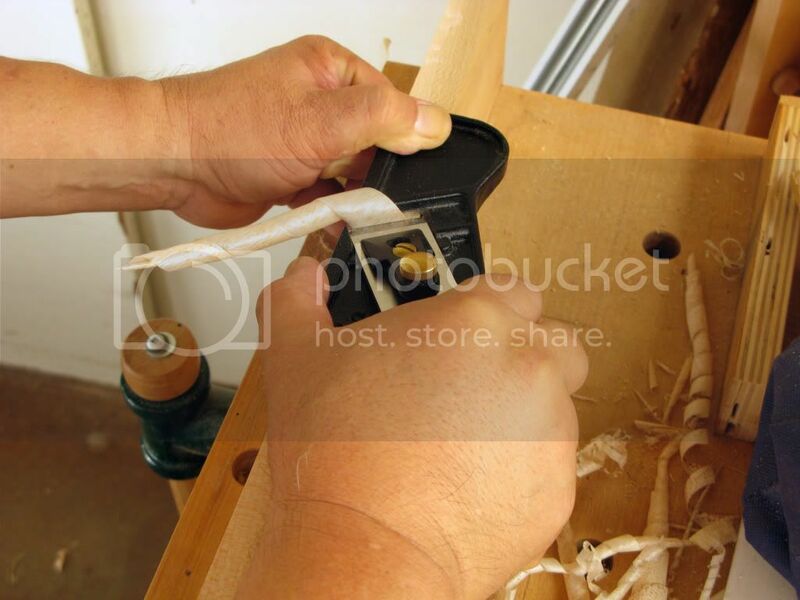 The blade is skewed 30 degrees which lessens the effort to plane and leaves a very nice surface. The plane is a low angle bevel up design with a 25 degree bevel for a total cutting angle of 37 degrees. On normal grain and edge grain the plane works extremely well. You can change the cutting angle by changing the bevel angle. I might pick up another blade and sharpen the blade at a higher angle to work on harder wood and difficult grain. One problem I’ve noticed as I was planning for this review is that I’ve gotten a number of chips on the blade. Not sure if its just coincidence or it might be a longer term problem. I am planing a lot of maple and plywood (glue?) so that might be the problem. The A2 blade is harder than the O1 blade so is more prone to chipping.. Maybe the O1 blade won’t chip as easily but it won’t hold their edge as long. I might get another blade and try a steeper angle for harder woods and difficult grain. The 25 degree blade bevel is at a thinner angle than bevel up blades so it could be the thinness causes the edge to chip easily on harder woods. Out of the box the blade was not very sharp. I did my usual sharpening routine. Flattened the back and honed to 8000 grit. Blade is relatively easy to hand sharpen as the bevel is wide enough to give it a solid footing. Fairly simple to use. Make sure fence is solidly on the face of the board and it should give you a nice 90 degree edge. Check the angle as mine was off. I added a little 1/8” hard board fence to the fence which stabilizes the cut. 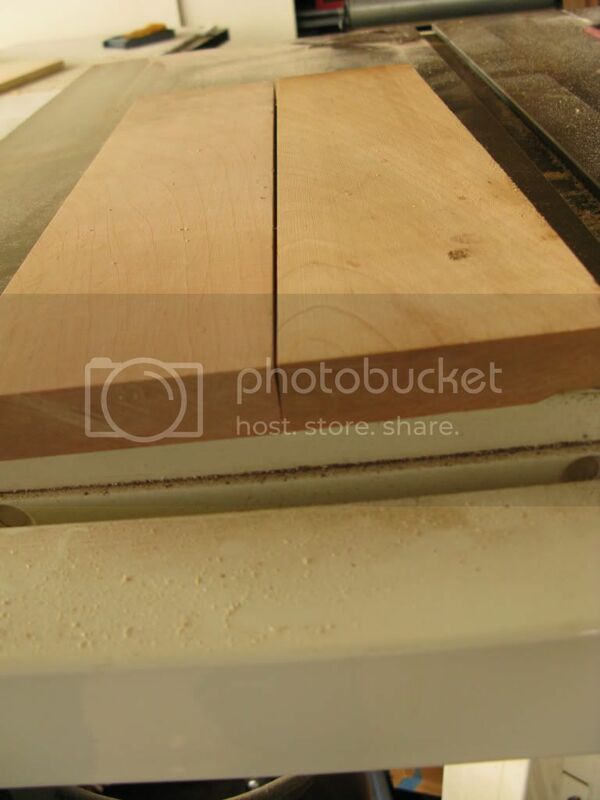 This reduces the cut from 1” to 7/8” which is wide enough for most 3/4” boards which are usually just a tad thicker. With the blade sharpened the plane cuts really well and leaves a really nice, smooth edge. I always check to make the edge is square if I’m gluing. I found getting the edge straight with a jointer plane then planing with the edge trimmer gave me an edge that perfectly buts together. The edge trimmer is a bit short so it sometimes can’t joint an edge if it wasn’t straight to begin with. This was very nice in touching up the edge a large audio cart I made for my daughter’s classroom. I had built the cart before my trip and was about to add edging when I came home with the edger. Gave it a quick trim (actually some were longer because I found some of the edges was really crooked) and trim went on much nicer than it had in the past. It would have been very difficult without it. The plane is a tool that I foresee using often. Thanks for the review. LV would have gladly exchanged and shipped any defective (not 90) plane in a case such as this. No need to deal with such things when such excellent customer service is waiting to assist. yeah – that plane needs to be dead on 90º. I would have asked for a replacement immediately. Got both version, rt n’ left.. and they’re true at 90 degrees. 1) Contact Lee Valley for an exchange. Even though you have already gone to the trouble of correcting the angle, they should still be made aware of the original problem. 2) A2 blades often need a slightly higher angle than 25. Try a small secondary bevel at 27 to 30 degrees next time you sharpen and see if that lasts a bit longer. This of course increases your cutting angle from 37 to the 39 to 42 range but it will be fine. 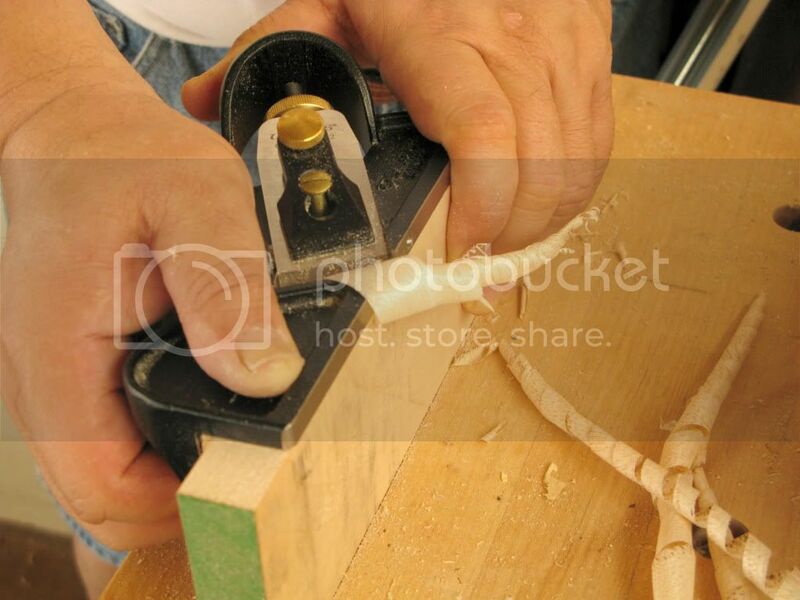 With a sharp blade, bevel up or down, engrain poses no serious problem. I notice your location is HI. Exchnages may be a bit more problematic for you there check into it none the less. I second all above to get a replacement – I’m positive LV would not hesitate to replace it. I agree with everyone above. The wonderful LV customer support is one of the reasons that I am a regular customer. By the way, I noticed that LV is offering free shipping until Jan 3. I have to say they do have excellent service and this is a little humorous story. When I went to LV in Vancouver, BC I took one of their sales lady around and typical LV she made a list of what I wanted. One of the items was this edge trimmer and I asked if she could open the display case so I could look at it. She went and got the key, I looked at it and told her I wanted it. After the list was complete she went back and got the items. When I got back to Hawaii I unpacked and my wife put the suit cases away in this long closet behind and under everything else. Happily began to put all the stuff I bought together. That night just as I was falling asleep I thought “Hey, I didn’t see the edge trimmer”. Kind of bothered me while trying to sleep. Got up the next morning and searched everything I unpacked and couldn’t find it. “On no I lost it!” I told my wife as I was leaving the house for an appointment. When I got home she had taken everything out of the closet, looked through the suit cases and no edge trimmer. She had put everything back in the closet and didn’t look too happy. I said I must have left it at the hotel remembering I took some of my tool purchases out to look at them. So I called the hotel and explained what it looked looked like and it must really be there. They called back and said they looked every where including lost and found and nothing. Sad thinking I lost it I went back and began taking out the tools I bought from the LV plastic bags when out fell the receipt. Looked at the receipt and no edge trimmer. What? ? Kept going up and down the list and no edge trimmer. So I called LV in Vancouver and explained that I knew the item was on the list but I never got it. The person asked for the receipt number and the salesperson number. She brought it up on the computer and no edge trimmer. So she called the sales lady in and she remembered that I wanted it because she had to get the key to open the display case. I could hear her telling the person I was talking to that it was her fault and she remembered I was from Hawaii. So she said she was going to send it to me immediately with no shipping charge and I got it a few days later. Their service is really good. Haven’t told the wife what happened. Maybe in a month when the pain of packing and unpacking the closet three times goes away. Hope you enjoyed my rather long stupidity story. Now after all that I felt a tinge of guilt, and being the type that likes to solve puzzles I went ahead and fixed it. After I planed the two boards and it didn’t match I took out my really good square and there it was, a pretty large slant leading outward. I like to think through these problems as it helps later when other problems arise. Also I just retired and it stems off the deteriorating brain. Have also bought their shoulder plane which is excellent. I have a cheap Chinese shoulder plane and it runs rings around it. I have a number of Japanese planes which are amazing but somehow I’ve not been able to get this Chinese plane to perform. I think its because it has a large mouth opening and the blade is difficult to adjust. I might do a review of the LV plane but I need a rest from all this writing and need to finish several projects I’ve been working on. Young, I am buying another blade so I can try a higher angle. Because I’ve been planing maple and plywood it may be the reason for the chipping. I’ll keep this blade for end grain and softer woods and try a higher angle for hard and difficult grain. I did a review on their low angle bevel up block plane and the 50 degree blade does wonders in hard wood and difficult grain. In fact last night I was planing a piece of maple trimming and instead of flipping the piece end for end I just turned it over. Went at it with the 50 deg. and realized after a few strokes what I had done. Must have been tired but no large tear out! Couldn’t see even small tear outs but I could feel a few fibers that had lifted and was able to fix it with just a stroke in the correct direction. I am now a believer in this technology if the tool is well made and you maintain them. Chuck, thanks for the tip. I’m putting my order in soon. Anyone have any idea how these compare to the original Stanley 95s? Oh, and I got the mini version for Christmas as well.. Works beautifly and it’s definately 90 degrees..
Hi just a quick point, in the veritas catalogue it says to use these planes on the pull stroke japanese style, not sure if this makes any difference but may help. Did your wife ‘understand’ your reason for mess in’ up the closet ? For an edge plane, not being 90 degrees is about as critical a failure as they come.